We cannot believe we have been here for almost a month. We have most of the downstairs unpacked, and it is beginning to feel like home. The dining room will not be completely unpacked until the construction on the stairs to the second floor is done. We hope that is by the end of September, and then we can have the carpet put down. First things first, and there needs to be some electrical updating, so that will happen before the stairs. In the meantime, we are doing some of the work ourselves. The living room is our personal project. It is a nice bright room, with a mural of the Rocky Mountains. Huh? That ledge has a very long planter with dirt in it. Boogie, the cat, thought we had gotten her the longest kitty litter in the world. We now have it covered until we decide what we are going to do with it. In the middle of the wall on the left, inside, is a chimney. It juts out into the dining room but neighbors have told us the opening is in the living room. We pried off a piece of paneling in the dining room and the chimney is wrapped in wallpaper. We used the wallpaper remover to remove two layers of paper, one with an Asian theme, the other with clover all over it. Under it is what we think is plaster. That means they plastered the bricks, and we will have a fun time knocking it off. Actually, it is a job we look forward to. Anyway, back to the mural. Bit by bit, it is coming off. Should be finished tomorrow, and then it will be sanded. Thanks Jan for the masks. They will save our lungs for sure. We will be ready to paint by the first of the week. The curtains for that large window arrived, and as soon as we paint, we can put them up. Will not miss these swinging verticals. These are our colors for the downstairs of the house. The bottom color is actually a sage green, and it is one of our favorites. The sage and off white will be in the living room and dining room, but we have not decided which walls. Guess we should before we start painting though. The terracotta is for the kitchen walls, with the cabinets being painted the light sage. The darker sage will be the trim. Eventually, we will replace the cabinets, but not now. They have been painted white over and over, and there is just too much white in there. Right now cabinets, the vinyl flooring, and the appliances are white. Oh countertops too. The only color is the wallpaper which is walls and walls of rose buds. It is coming down next. The kitchen is being professionally done, but we could not get on his calendar until November. Oh, forget to mention the decals over the sink to add a splash of color. 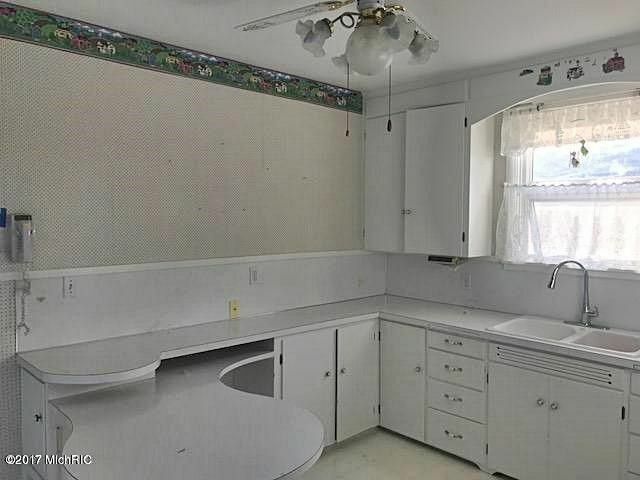 The second day we were here, my brother cut out that kidney shaped table and the counter and cabinets in the center of that wall. We are using a pantry cabinet we had, and already it looks better. Photos soon. But you can see the white. It is a bright and big kitchen, and it will look so good when we are finished. We are getting granite countertops also. We keep busy. We have a three season porch that I think will be nice when it is not so warm out. It might just be a 2 1/2 season porch. Maybe it needs a hot tub. Pictures of that soon. We have found some good restaurants, most of which serve fresh perch, a favorite. The restaurant that is down the street serves fresh turkey dinners every day of the year. That is my favorite meal of the year. Now I can have it all year long without have to mess up our kitchen. One of our favorite things in the house is actually outside the house. It is our lamp post. It is so tacky that we love it. Today it rained, which showed up a beautiful spider web being hosted by the squirrel light. We have a dog face in our bedroom door. You find all kinds of interesting things in a 78 year old house. Hope this answers some of the questions we have been asked. We will keep you all up to day on the progress.